The following Solid Ground Farmer Trainings are scheduled for January. All classes are free, but registration is requested. Email Charlotte.Ross@uconn.edu for more information. SOUTH WINDSOR, CT – UConn Extension’s 2019 Vegetable & Small Fruit Growers’ Conference will be taking place on Monday, January 7th, 2019. The conference will be held at Maneeley’s Conference Center on 65 Rye Street in South Windsor. The day will include 9 educational sessions, an extensive trade show with over 30 exhibitors, and plenty of time for networking. 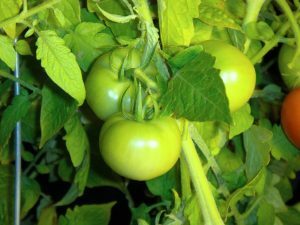 Session topics range from Farm Labor to High Tunnel Production including Growing Brambles, Growing Strawberries and Tomato Nutrient Management. Other highlights include a Cut Flower Production session that will give us a taste of the following full day workshop on January 8thin East Windsor. A farmer panel that will discuss Marketing, specifically POS (point of sale) Systems will round out the event. Three pesticide re-certification credits will be available for licensed applicators. 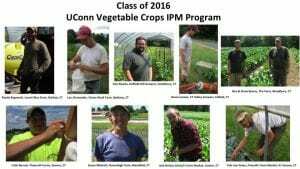 This event is organized by UConn Extension, Connecticut Agricultural Experiment Station and the Connecticut Vegetable & Berry Growers’ Alliance. The steering committee uses evaluations from previous years to produce a fruitful program, gathering the best speakers from within our region and across the country to fulfill the requests and meet the needs of Connecticut growers. This day will not only be great for learning, but also for networking with other growers, Extension educators and industry representatives. We hope you take the time to gather plenty of ideas and knowledge to take home with you to practice on your own farms and improve your farm businesses. Pre-registration to attend the conference is $40. The pre-registration includes the trade show, continental breakfast, coffee, and lunch. The pre-registration fee for students (high school or college) is $18 (must show valid ID). Pre-registration must be received by January 2nd, 2019). After the deadline and at the door is $60 per person. The registration form, additional information and other upcoming events can be found at http://ipm.uconn.edu/under events. This institution is an affirmative action/ equal employment opportunity employer and program provider. Contact us 3 weeks in advance for special accommodations. Some medium to larger Connecticut farms need to comply with the Produce Safety Rule (PSR). This includes taking an approved food safety course, implement- ing certain practices that can minimize risk, and keeping records related to those practices. The Connecticut Department of Agriculture conducts a variety of activi- ties related to implementation of the rule, including developing an inspection pro- gram that meets the requirements of the US Food and Drug Administration (FDA). 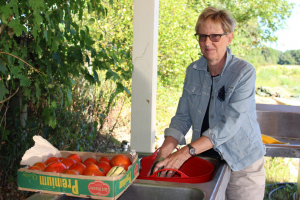 UConn Extension conducts approved Produce Safety Alliance grower food safety courses and provides informa- tion and resources to help farms comply. Training details can be found at http:// foodsafety.uconn.edu. Both the Department of Agriculture and Extension are encouraging all farmers to take the course, whether they need to comply with the PSR or if they are exempt or not covered by the rule. 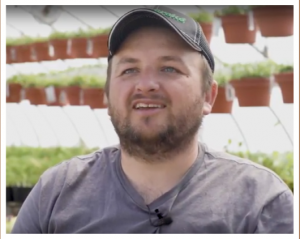 Awareness of how produce can contribute to foodborne illness and how to implement safe food handling practices on the farm benefits the industry and its customers. Fruits and vegetables add important nutrients, color, variety to our diet. Most of us enjoy them raw in salads, as a snack, or dessert. However, in the last few years there has been an increase in the number of foodborne illness outbreaks asso- ciated with fresh fruits and vegetables. Spinach, cantaloupe, tomatoes, cilantro, and green onions, have been on the outbreak list. Many consumers are unaware that produce is the number one source of foodborne illness—it is more likely to be associated with foodborne illness than meat, poultry, fish or dairy products. A series of programs and laws were developed to bring consistency nationwide and reduce the number of foodborne illness outbreaks. These include: Good Agricultural Practices (GAP)—a voluntary audit program, the Food Safety Modernization Act (FSMA), and the FSMA Produce Safety Rule. foodborne illness from fresh fruits and vegetables. Farmers that are not exempt from the rule must attend approved training. 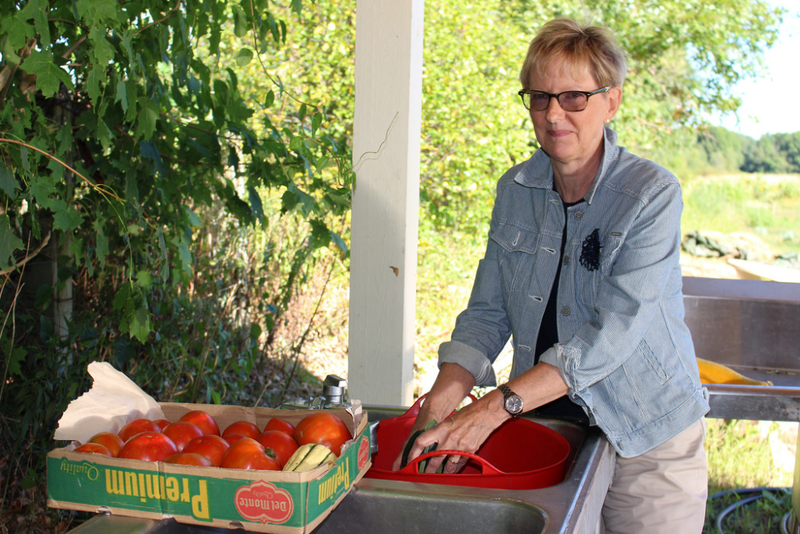 UConn Extension Educator Diane Hirsch offers the Produce Safety Alliance course, and GAP audit preparation courses. First of all, I deeply appreciate everything Extension educators do for us as farms. I give credit to Extension for everything I’m good at growing. I think the only way agriculture can be strong in this state is if we all do a good job at it. Part of this is food safety. Admittedly, the part I knew the least about was food safety. The produce rule and FSMA kind of scared me, not knowing anything about it. It’s a very complex law. Plus, our farm also wanted to achieve voluntary GAP certification. Essentially certain buyers on the wholesale level require you to be part of GAP so they can meet the qualifications of their food safety program. At Gresczyk Farms LLC in New Hartford we grow 130 acres of vegetables. We also have 3⁄4 acres of greenhouses, with vegetable crops grown inside, and 600 laying hens for egg production. I became a course instructor for the Produce Safety Alliance Course, working with Diane. I like learning and talking about stuff. I figured the best way to handle food safety on our farm is to learn how to teach it. I’ve always been very open with other farmers, and happy to talk to anybody about grow- ing. It gets back to my theory of if we’re all good at farming, it helps agriculture in general. That was my motivation to become a trainer. I recommend anyone take the class, even if you’re just doing a little bit of farming. It doesn’t matter if you’re growing an acre or 200-acres. The FSMA class can really help farmers improve their decision making. It’s helped me address the food safety practices on our farm. A lot of what farm- ers are already doing is right, I found it was tweaking more so than anything else. It definitely raised my awareness. We were GAP certified in summer of 2017, and changed a lot of things, but in a good way. and exclusions in FSMA should take the training we offer through Extension. I always say that if everyone can take a food safety class it will go further than all of these rules, and this even applies to consumers. If you touch food, you should have some basic knowledge of food safety, and really most of us don’t. And that’s okay too, but the biggest thing you can do is just go through a class. It’s really handy to learn some of these basic practices. Then you’re aware as you’re doing things, it literally can save somebody’s life. It’s a way to think about it, and just to be aware. Our farm, we’re always growing, we’re trying to get bigger and better every year. We love doing that, and we love growing. Most of all I want to circle back to thanking Extension. Without Extension’s resources’ we wouldn’t have access to science-based, unbiased information. It really helps us incredibly. Even farms that have a lot of exemptions and exclusions in FSMA should take the training we offer through Extension. I always say that if everyone can take a food safety class it will go further than all of these rules, and this even applies to consumers. Our farm, we’re always growing, we’re trying to get bigger and better every year. We love doing that, and we love grow- ing. Most of all I want to circle back to thanking Extension. Without Extension’s resources’ we wouldn’t have access to science-based, unbiased information. It really helps us incredibly. A young couple I know if looking to buy their first house. She prefers older homes with character, he wants space for a big garden. They came upon an older home with a dirt basement floor….I immediately thought that it might be a good candidate for a root cellar. In earlier times, when many people grew their own food, lived miles from the nearest grocery store, and did not have the benefit of electricity or refrigeration, they often stored some fruits and vegetables for the winter in root cellars or outdoor cold storage areas or pits. Today it can be difficult to use the basement for storage as many of us now use our basements as living spaces. We may have furnaces, boilers or woodstoves in our cellars—instead of dirt floors and cold storage shelves. We do everything we can to keep out the dampness. And houses are built to retain heat in order to save energy. And, of course, in general, Connecticut temperatures seem to be warmer longer into late fall and early winter, than they used to be. All of this means that we just have to be a bit more creative if we want to store our late summer/fall crops into mid-winter. You should recognize that “ideal” storage conditions for many vegetables are not attainable around the average home. Commercial cold storage options often involve a modified or controlled atmosphere, reducing the oxygen and increasing the carbon dioxide level, while high humidity is maintained in an air−tight, refrigerated storage room. 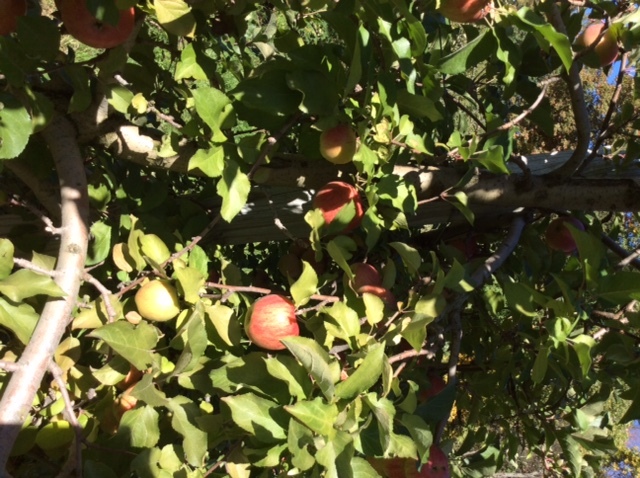 It is important to understand that these conditions cannot be achieved at home…your home-stored apples will not be equal to the quality of a store-bought apple in January or February. That said, there are many lower-tech options for storing apples and other foods at home. You just have to remember to follow the rules! Minimize the effects of strong smelling vegetables such as onions, cabbage or rutabagas. Some vegetables can be stored outdoors—or even remain in your garden, if well protected. Root crops including carrots, parsnips and turnips can remain in the garden, if rodents are not an issue. 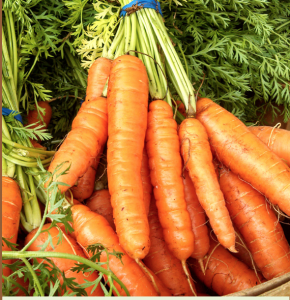 A well-drained location is essential as a muddy puddle does not do much for your stored carrots. Once the ground is cold, or begins to freeze, protect the vegetables from frost and fluctuating temperatures with insulating materials such as clean straw, hay, dry leaves, corn stalks, or wood shavings, and some soil. Mounds or pits are a good way to store cabbage and root crops, such as carrots, beets, celery root, kohlrabi, rutabagas, turnips, and winter radishes. Use a well-drained location, and cover the ground with insulating mulch. Vegetables keep very well in pits and mounds, but once these storage areas are opened all the produce should be removed. After it’s removed, the produce will keep for 1 or 2 weeks at most: use it up quickly or cook and freeze for longer storage. 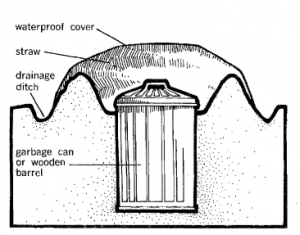 If rodents are a problem, try burying a 20-gallon trash can in the ground. Several small holes should be made in the bottom to allow for drainage (keeping in mind that rodents may be able to get through a dime sized hole). A Connecticut home—especially an older one—offers several options for winter storage of fruits and vegetables. You could use a breezeway, a shed, a Bilco-type basement door area or a garage that is not used for storing your automobile, lawn equipment or chemicals that may affect the flavor of your stored produce. You may be lucky enough to live in a house with an old root cellar or a cellar that does not warm up too much when the furnace gets turned on. Check the room temperature to make sure that the area is cool enough (32˚F–60˚F) and be sure that the temperature does not fluctuate too much. The relative humidity (moisture in the air) of these locations will also affect what type of produce can be stored. Some produce (garlic, onions) store better in dry conditions, while others (apples, root crops) prefer conditions to be more humid. A pantry, attic, or unheated room is useful for short-term storage of potatoes and onions as long as there is no danger of freezing. Low storage temperatures extend the shelf life of dried foods, such as dried beans, herbs, dried fruits and vegetables. A warm storage area, such as an attic, can be a good environment in the fall for drying herbs, beans, walnuts, or hickory nuts. A well-ventilated basement with central heating is generally dry and has a temperature range of 50˚F to 60˚F. It may be used for ripening tomatoes and for short-term storage of pumpkins, winter squash, potatoes, sweet potatoes, and onions. Once everything is stored away, you will need to monitor your storage areas, paying attention to temperature (can be made cooler or warmer with ventilating windows that can be opened and shut); humidity (a relative humidity of 90%–95% is very moist and good for storage of potatoes and other root crops. A relative humidity of 60%–75% is dry and good for storage of pumpkins and other squash). Check the storage area at least weekly. Look for evidence of rodents. Check to see that produce is still dry. Remove and discard anything that is rotten or moldy. Exploding pressure canners and botulism scares can keep folks away from canning, but cold storage is pretty much risk free. If it doesn’t work, you will see, feel or smell that your food has spoiled—and you will not eat it! Cold storage temperatures also slow the growth of spoilage organisms and enzymatic action (causes over-ripening and rotting). However, there are a few food safety hazards you should pay attention to. First, be sure to use storage containers that are food-grade. Never use drums, garbage cans or containers that might have held garbage, pesticides or other chemicals. Be sure that the insulating materials used are not contaminated with pesticides or manure. These should be new materials and should be used only once as they will become contaminated with mold and bacteria. An important risk to consider is that when using cold storage, particularly outdoor storage options, you need to be wary of the presence of rodents or the pesky neighborhood raccoon. Be sure to inspect the inside and outside of the root cellar. Look for gaps (even very small ones) between the ceiling and walls, walls and floors and around any air vents or windows. Search areas around vents, joints between the walls and roof and the area under the cellar. Patch any cracks or gaps around pipes or plug openings with steel wool. Use storage containers that animals cannot chew through, such as metal, plastic or tightly woven mesh with openings smaller than ¼ inch. Secure the top of the containers in the cellar or the lids of buried containers so that they cannot be opened by animals. When you are ready to use your fruits and vegetables during the winter months, inspect everything you take out. While small amounts of mold can be removed from hard fruits and vegetables such as potatoes, generally, if there is mold, we recommend tossing it out. Mold toxins have been associated with allergic reactions and some are cancer causing agents. Wash everything thoroughly with water and a scrub brush before eating. Finally, at the end of the season, be sure to clean all containers and the room itself in order to reduce the presence of molds and bacteria. For more information about managing a cold storage area and a storage chart for specific fruits and vegetables, search for the following article, which was used as a source: Storing Vegetables and Fruits at Home, from Washington State University Extension, or contact the Home and Garden Education Center at ladybug@uconn.edu or 1-877-486-6271. This time of year, those of us who make an attempt to eat seasonally, “root” vegetables are a mainstay. Though most are available year round, roots are something that you can continue to find at your local winter farmers market—grown in Connecticut. At my New Haven market, I have seen carrots, beets, radishes, all types of potatoes and even celeriac or celery root. But, after doing a bit of research, prompted by an article sent to me, I discovered that what most of us know as root vegetables, may not actually be root vegetables as a knowledgeable botanist could tell you. True root vegetables include taproots and tuberous roots. Taproots grow downward into the ground. They tend to be drought tolerant, sending out roots 20 to 30 feet long in search of water, if necessary, in dry climates. Typically they are tapered in shape: a main root with other roots that sprout off the sides. Taproots include beets, parsnips, carrots, turnips, radishes, rutabaga, jicama, salsify, celeriac, and daikon radish. This list is not exhaustive and does include several taproots that appear to be shaped more like a ball than a tapered carrot. Tuberous roots are modified lateral roots, many of which (sweet potatoes, cassava) look just like taproots: others look more segmented such as ginger or turmeric. Corms, rhizomes and tubers (different from tuberous roots) are really stem structures, not true roots. But many a roasted root vegetable recipe will list them as ingredients. Generally speaking, they are referred to as roots in agriculture as well as culinary uses. Corms, constructed of vertical underground stems, include Chinese water chestnuts and taro. You no doubt have seen taro chips in the snack food aisle in your local grocery store or fancy food shop. They are often used by higher end restaurants as a garnish as well. They are an off-white color with dark striations and have a nutty flavor. In Hawaii, taro is cooked, mashed and made into poi, a thick liquid, often eaten with the fingers. Rhizomes are also stems, not roots. Not all rhizomes grow underground, but ginger, ginseng, turmeric and lotus roots do. When growing, they look like a mass of horizontal roots (though, again, they are NOT roots). Finally, tubers are a class of root-like vegetables that include potatoes, and some varieties of yams. They are formed from thickened underground stems. Historically, because they are inexpensive to grow and store, root vegetables were often considered to be food for the poor. But the richness of a diet high in colorful beets, carrots, potatoes and sweet potatoes, flavored with garlic or shallots (which are bulbs, not roots), turmeric, ginger or radishes is something we can all benefit from. One thing that all of these true root vegetables, corms, rhizomes, and tubers have in common is that they serve as storage organs for the plant. They are a major source of carbohydrates, the nutrients that provide energy essential for plant growth and metabolism. Often these vegetables are placed on a do not eat list for those trying to cut down on carbohydrates. This would be a mistake, though. These carbohydrates generally digest more slowly and contribute to the energy needs of the human body, just as they do for the plant. Not only that, but they are also great sources of fiber (for heart health and gastrointestinal system health) and phytonutrients, which are not vitamins, but chemical compounds that have antioxidant and anti-inflammatory properties in humans. 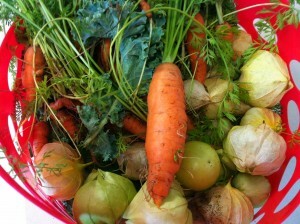 If you have a backyard garden, consider adding root and root-like vegetables to your “to plant” list this year. They are not difficult to grow if you pay attention to soil quality. 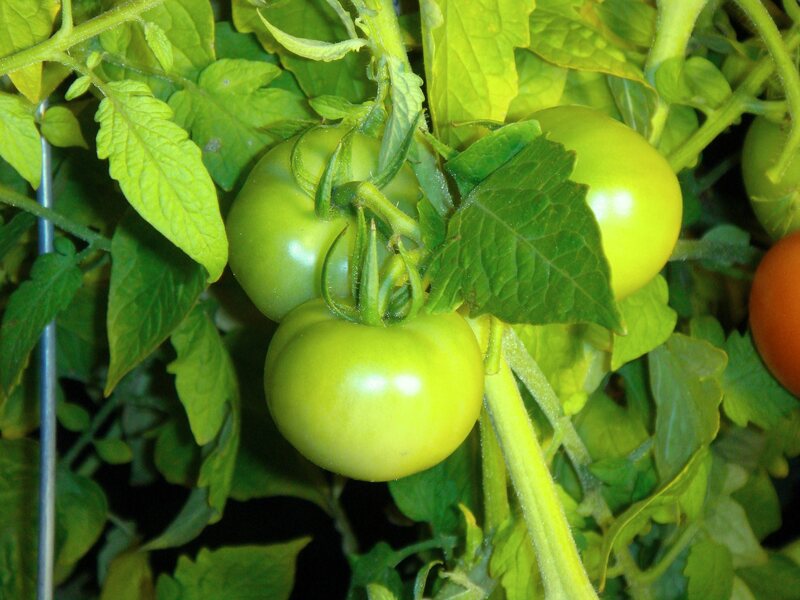 They grow best in a deep, loose soil that can hold moisture, but is well-drained. Root crops do not grow well in very acid soils. So, don’t forget taking a soil sample so that you will know if you need to treat with fertilizers or lime. Planting of root vegetable crop seeds generally begins early in the season—as early as the beginning of April for most in Connecticut. For more information on growing, preparing or storing root vegetables, contact the Home and Garden Education Center at ladybug@uconn.edu or 1-877-486-6271. Connecticut has an abundance of farms that open their gates to those who want to pick their own raspberries, apples, vegetables and other seasonal offerings. I have picked raspberries well into October in the past, though I am not sure how the hot summer and early fall have impacted the longevity of the berry season this year. 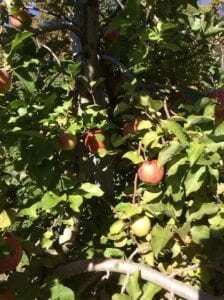 But, you can easily find apples and perhaps pears only a short drive from where you live. To find Pick Your Own (PYO) farms near you, go to www.ct.gov and search for “pick your own farms in Connecticut.” This will bring you to a list of farms by county offering small fruits (berries), large fruits (apples, pears) and vegetables as well as pumpkins and Christmas trees. However, this is not an article simply about where to find PYO farms. This is a message about being a responsible PYO customer. Chances are you have read articles about fruits and vegetables being the source of foodborne outbreaks in recent years. Produce has risen to the top of the list as likely sources of illnesses caused by Listeria, Salmonella, E. Coli and parasites such as cyclospora and cryptosporidium. Produce can be contaminated in the field and during harvest. Wildlife can deposit poop in the fields or directly on the fruits or vegetables; rodents and insects can contaminate produce with animal manure that can be on their feet; those who harvest produce can contaminate apples or pears or berries with dirty hands. 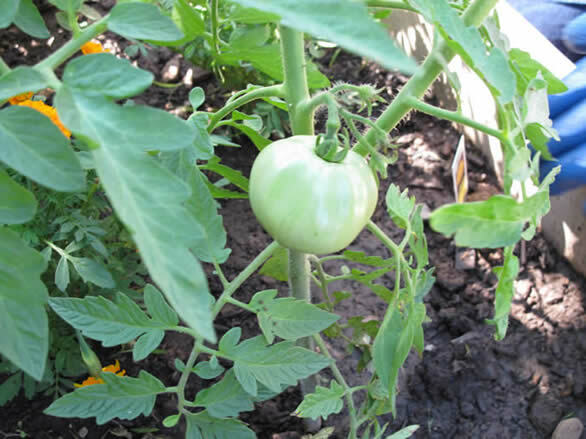 Irrigation water can also contaminate produce if the source is not safe. Nature is nature, but there are things you can do to minimize your risks. In a PYO operation YOU are the farmer, the harvester, the handler. While most consumers would never eat berries or apples from the grocery store without washing them first, they think nothing of plucking the strawberry right off the vine and popping it in their mouth. Or they let their young children do it—a population that is more vulnerable to the worst effects of a foodborne illness. So, what are some simple guidelines for a safer PYO experience for you and your family (and others who follow you in the field or orchard)? Be sure to wash your hands before picking. Your farm does not have a handwash station? Complain. Especially if this farm also has an animal venue—goats to pet or llamas to feed. After visiting the animals it is especially important to wash your hands. Sanitizer does not do much good on dirty hands. You need soap and water. If sanitizer is your only option, certainly you should use it. But farms by now should know the need for both bathroom and handwash facilities for their patrons. When I was picking raspberries a few weeks ago, a young woman in the next aisle was complaining to her companion that she did not feel well. She had a sore throat and was coughing. I moved away from her. Sick people should not be picking berries. Period. Again, if the farm does not provide clean containers, bring your own or go elsewhere. It could be as simple as lining reuseable bins or boxes with a clean plastic bag or liner for each new customer. Containers with even a few hours of accumulated juice, dirt and field debris can certainly harbor the bacteria that we really do not want to bring home with us. Again, two words: wildlife and poop. Pick berries from the vine, fruit from the tree. “Drops” always run the risk of being contaminated with microbes that can cause an illness. If you see any evidence of deer or other droppings, be sure to tell a farm employee. Avoid produce that has evidence of bird droppings. Rotten, moldy or produce that may have been chewed by bugs or rodents should be left on the vine. Rotten spots, cuts, and other breaks in the surface of the fruit or vegetable can be a microbe’s doorway to the inside. Handle what you pick carefully. Farms do not really need another animal to worry about. Dog waste is no different from that of wildlife. Even the most conscientious owner can leave traces behind as they pick up after their dog. And, finally, watch the kids. PYO operations are a great way to teach children where their food comes from. It gets them outdoors and provides much needed time away from touch screens. But, it is important to teach them good PYO etiquette as well. Do not let them pick up drops from the ground or eat directly off the plant and tell them why it is not a good idea. Teach them the importance of washing their hands before handling food. Feed the kids before you visit: bring a water bottle, but it is best not to eat snacks in the field. Save the picnic for later. Please do not change diapers in the field. Remember what I said about wildlife and poop? Do that in your car and be sure to dispose of the dirty diapers in a covered trash receptacle. For more information on safe food handling, contact the Home and Garden Education Center at ladybug@uconn.edu or 1-877-486-6271 or visit www.foodsafety.uconn.edu. 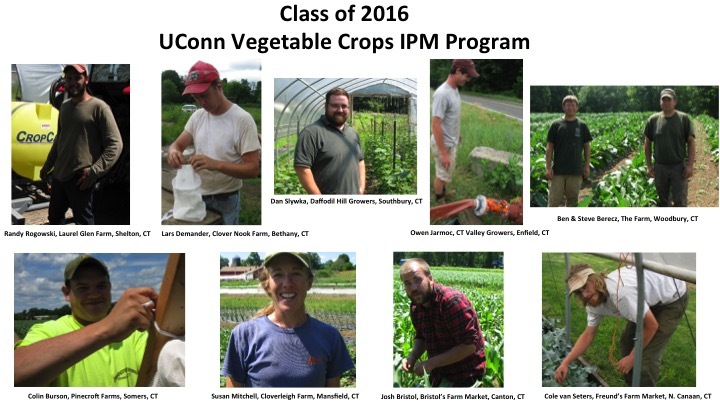 Each year, UConn Extension Educator Jude Boucher helps commercial vegetable growers find sustainable solutions to pest problems. The program emphasizes healthy soils, balanced plant nutrition, proper pest and beneficial identification, scouting and monitoring techniques, preventative management strategies, reduced-risk pesticide selection application, and resistance management. Farmers apply to become part of the program, as space is limited to 12 farms per year. Those accepted into the program receive weekly, or every-other week farm visits from Jude, as he provides education and guidance for the specific challenges the farm is facing. This year’s farmers are from 9 different towns, with operations varying from 2 to 120 acres of vegetables, with over 40 different vegetable crops being grown.